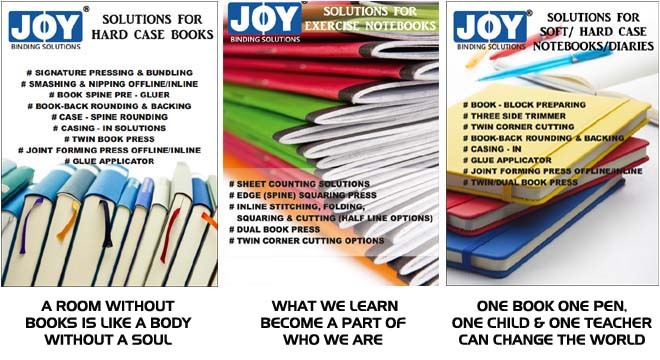 JOY D-ZIGN ENGINEERS was established in 1995 to design, develop and manufacture machines and systems for the post press and exercise notebook segment. The machines are designed for enhancing the quality of Book Blocks / Soft & Hard Cover Books and Note Books based on Hydraulic Technology. Joy D-Zign Engineers Pvt. 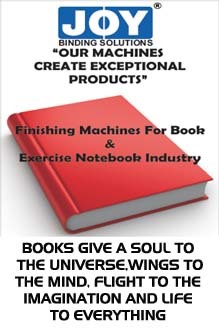 Ltd.
Our products are suited for preparation of book blocks for any kind of books (Hard-Cover/Perfect-Bound Books, Diaries, Dictionaries, Directories, etc) and finishing of cased-in Books and stationary/exercise notebooks. You can also view videos of our machines and download PDF's on the product page.